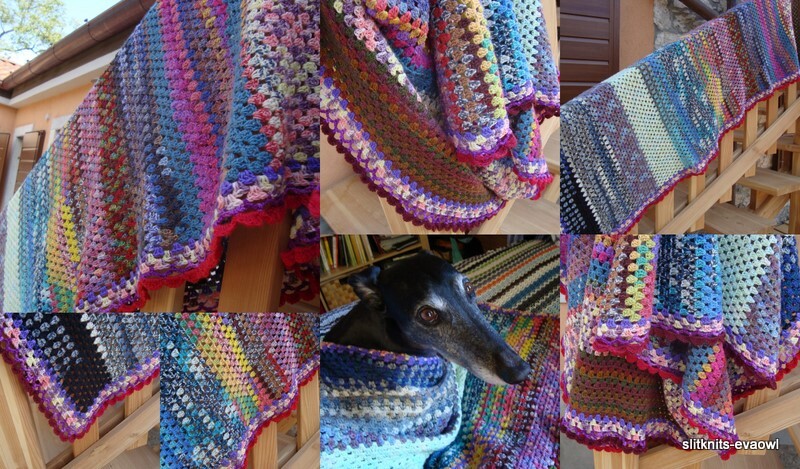 It was so windy yesterday......there was nothing else to do than finish the stash-buster throw. It's funny how a blankett could be used as a knitting reminder. In there you'll find kid's socks, shawls, experiments with Kool-aid, gloves and mittens, one or two hats. It's a nice way to clear your yarn corner and preserve your personal history. Well, maybe we are not really talking of breaking news, it's just a throw, made superb (ooops, again) by the finishing I've learned thanks to an Attic24's tutorial. Mindy likes it, but she will not enjoy it - he,he. It will be for my personal use. I love it, very colourful - I agree too good for dog use, however cute the dog! Yes, wild colours, going together so well! I like your colourful throw. And what exactly is "Ubi maior, minor cessat"?